The Atlas 3A is a two-stage rocket capable to lifting payloads of 4,060 kg (8,950 lb) into a geostationary transfer orbit. It features no strap-on solid rocket boosters and is the most powerful version of the Atlas family currently available. Atlas is the name of a family of booster stages. Centaur is a family of high-energy, restartable upper stages. 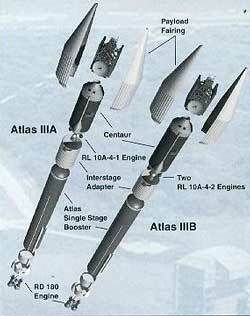 Atlas 3 is the designation for an Atlas 3 stage with a booster engine and a Centaur 3 upper stage. The Atlas booster is 10 feet in diameter and 84 feet long. The propellant tanks are a thin-wall, fully monocoque, corrosion resistant stainless steel construction. The fuel tank, which contains RP-1, and the oxidizer tank, which contains liquid oxygen, are separated by an ellipsoidal intermediate bulkhead. Structural integrity of the tanks is maintained in flight by the pressurization system and on the ground by either internal tank pressure or application of mechanical stretch. Atlas booster propulsion is provided by the RD AMROSS RD-180 engine system, which consists of two thrust chambers fed by a common turbopump assembly. The engine is ignited before liftoff and develops a total sea-level-rated thrust of 617,500 pounds. The interstage adapter connects the Atlas to the Centaur. This aluminum structure provides the structural link between Atlas and Centaur. The Atlas is separated from the Centaur by a flexible linear-shaped charge system attached to the forward ring of the interstage adapter. Centaur, the Atlas upper stage, is 10 feet in diameter and 33 feet long. It employs high-energy liquid hydrogen and liquid oxygen propellants separated by a double-wall, vacuum-insulated intermediate bulkhead. The propellant tanks (like those of the Atlas stage) are of thin-wall, fully monocoque, corrosion-resistant stainless steel construction. Tank stabilization is maintained at all times by internal pressurization or application of mechanical stretch. The Centaur propulsion system uses one RL10A-4-1B engines with an extendible nozzle manufactured by Pratt & Whitney. The engine has a rated thrust of 22,300 pounds. The Centaur engine is restartable and is capable of multiple firings in space, separated by coast phases. The payload fairing protects the spacecraft from time of encapsulation through atmospheric ascent. 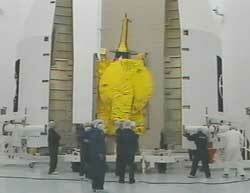 The fairing used by the EUTELSAT W4 mission is 14 feet in diameter. The fairing provides thermal and acoustic enclosures for the payload and launch vehicle electronic compartments during prelaunch and ascent. 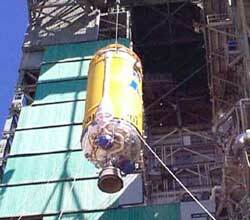 Portions of the external surface of the fairing are insulated with cork to limit temperatures to acceptable levels. Noncontaminating thermal control coatings are used on internal surfaces to reduce incident heat fluxes to the spacecraft. The payload fairing is jettisoned eight seconds after Centaur Main Engine Start 1. The mechanical interface between the spacecraft and the launch vehicle is provided by a Lockheed Martin-built standard adapter. While coasting in the transfer orbit, the Centaur issues separation commands to release and separate the spacecraft from the forward adapter.